TOP jumper prospect. Has been LIGHTLY backed, and free jumped a couple times and is an absolutely freakishly good jumper. 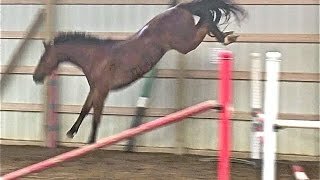 You cannot train a horse to have instincts like this young horse has. Offered for sale to serious professional buyers looking for a top class Grand Prix jumper prospect. This horse is the real deal. He has scope, power, carefulness, intelligence, sensitivity, and technique. He has every component you could want in your next GP prospect.